A short time ago it was put to me, by an LA taxi driver, how great it must have been to have moved from London to San Francisco, because he imagined the two cities were very similar… . I found myself nodding along, as you do, but then I checked myself and half said half shouted ‘NO!’, a little too abruptly. He looked a little frightened, and I quickly scrambled to explain myself, apologising for my less than polite outburst, as only a Brit can. But I desperately wanted him to know that, while it was great that we were able to make the move to SF (ish – we live just outside), the two cities, and the people that live there, in my opinion weren’t similar at all! We left London after a fairly long stint, slightly exhausted and frazzled by the monotonous commute, endless grey days, the cost of living and lovely but grumpy people always ready to give you hell for no good reason whatsoever! We had fallen out of love with it and we certainly weren’t making the most of being there. We completely took for granted all of the wonderful things that make it unique. We arrived in San Francisco’s Bay Area very ready for change. A change in pace, lifestyle…weather. What we found was exactly that. We carved out our own Californian life, and we’re probably a bit healthier, a bit more positive and a bit less likely to give someone hell if they were to accidentally bump in to us! That said, each time I’ve visited London since leaving, it has surprised and thrilled me – I have got the love back! I guess this must have been why I was so determined to make sure that my LA taxi driver knew what set the two cities apart…in my opinion. So I’ll explain to you some of what I explained to him, though probably slightly more eloquently and in a less shouty voice. First things first though. I love them both. I love them both in different ways and for different reasons. Art – In spades. Museums full of the stuff, literally bursting at the seams with archives so extensive that there will never be an end to what can be seen, and the best bit is it’s FREE. I cannot express how fortunate we are in the UK to have so much exposure to the arts. Whether that’s seeing it in museums. FREE museums. Or being taught it at school. I recently found out that art isn’t a ‘required’ part of the curriculum here in California – what a shocker! Fashion -A fellow British immigrant once described walking through a bar in SF only to be looked up and down by a group of ladies who smirked and giggled at her outfit – a pretty average high waisted skirt, heeled boots etc. She noted that they were all wearing what seems to be the standard uniform of skinny jeans and converse, and they made it pretty obvious that they were not too impressed that she had dared to push these boundaries. Now, people are usually pretty friendly here so I wouldn’t say that this is typical behaviour, but it kind of illustrates my point. To ‘dress-up’ here is not the norm. It’s acceptable to wear your gym clothes to a restaurant and a heel is rarely seen (possibly on account of all the hills!). Anyway, I totally took for granted that London is so cutting edge and accepting when it comes to fashion, and that it is accessible to pretty much everyone. That even the high street stores have their runway ripoffs. That it is ok to experiment and that it is ok to try something new without being ridiculed. Public Transport – I used to whinge about tube strikes, the central line, late buses, cancelled trains but now…oh how I long for the Piccadilly line and the number 38 bus! NHS – perhaps more of a general UK thing but, I miss it. The freedom and security of being able to see a doctor with no self-diagnosis necessary…priceless…literally. And knowing that, at said doctors appointment, you won’t run the risk of paying for tests or medication that you don’t necessarily need. it doesn’t feel like a city – well not as I think of a city. It feels more like a town or a group of conjoined villages, all different in their own way. It doesn’t have the same massiveness of London or New York. It doesn’t have that, sometimes slightly, lonely/exciting feeling that you could get lost at any moment. It’s more gentle, laid back, quiet. Kind of like a beginner city…I hope that’s not taken as an insult…it’s certainly not meant to be. landscape – It’s amazing. This city, seven-by-seven-miles, and at the tip of a peninsula. A writhing ocean on one side and a turbulent bay on the other. A city whose limits include rocky islands surrounded by great white sharks and a prison perched on top of an island. A city built on hills so huge that, when looking back at it from the bay, you double take gobsmacked that the skyline in front of you is actually real. location – I don’t think the number of truly incredible places that we’re lucky enough to have on our doorstep will ever get old. 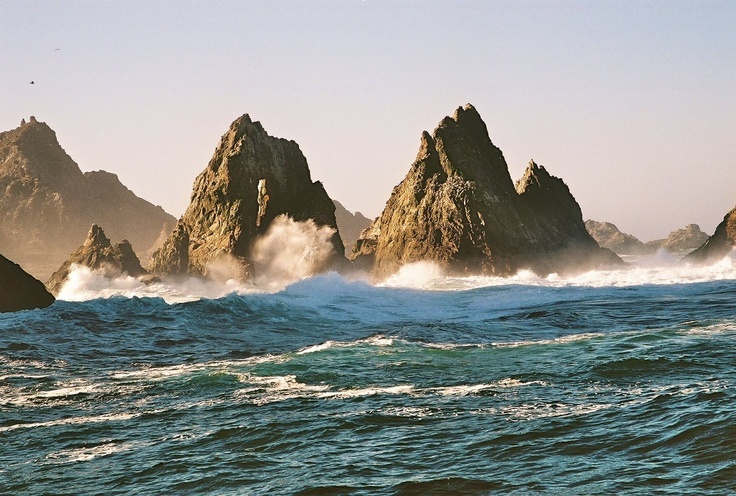 From giant redwood trees, stunning stretches of coastline and the rolling hills of wine country to the lake and mountains at Tahoe, epic landscape of Yosemite and mysterious Farallon Islands. innovation – I’ve come to realise that the tech industry and Silicon Valley (just a few miles south of SF) is met with the same ‘love it or hate it’ attitude, by locals, as Marmite. My feelings are mixed. Perhaps because I’m not local and so have the advantage of seeing it from both sides, without the emotion. That said, one of the things I do love about living here is the thrilling feeling that something’s always on the verge of being discovered! So this is how I see it right now, after living here for just over two years. I do wonder whether I’ll feel the same a few more years down the line…I’ll keep you posted! Next > How can I keep from singing?